HEBRON, Ky. -- The country's first-ever law enforcement "honor flight" returned home Tuesday night to a waiting crowd of 1,000 well-wishers at Cincinnati-Northern Kentucky Airport. Honor Flight Network organizers said they had never seen such a large turnout to welcome passengers home. "We need more of this in America," Chief Jim Gilbert, who accompanied his Vietnam veteran father Harry and brother Officer Eric Gilbert on the trip, said. "(It was) overwhelming," Harry Gilbert added. "I never dreamed something like this. … I am at a loss for words." 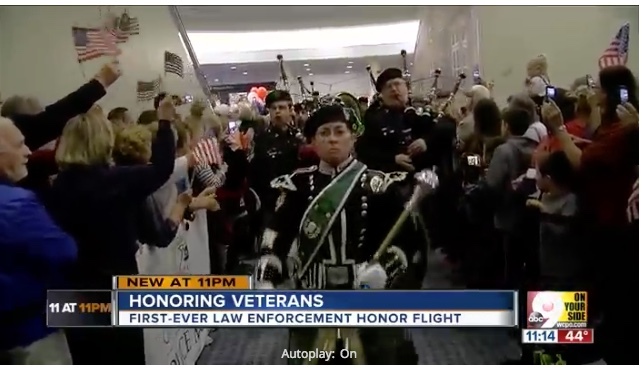 The Honor Flight Network recognizes veterans by flying them to Washington, D.C., to visit memorials dedicated to the wars in which they fought. 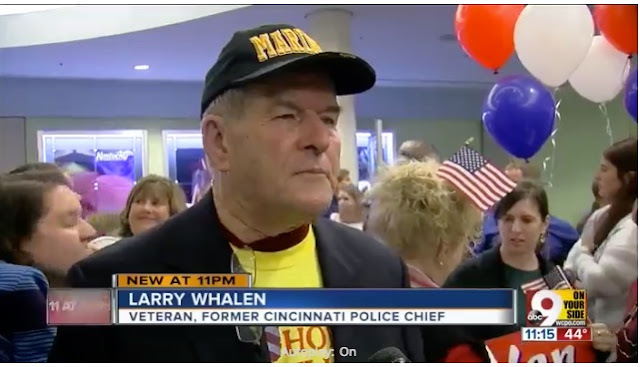 Tuesday night's was special in that, like Harry Gilbert, every passenger honored by the trip was a veteran who entered law enforcement when they left the military.